When we give ourselves the gift of sacred space we are feeding our heart, body, mind and spirit. A special place tucked away from the hustle and bustle of everyday living, where one can sit quietly and commune with the divine. Sanctuary for meditation & prayer ~ An offering of peace . 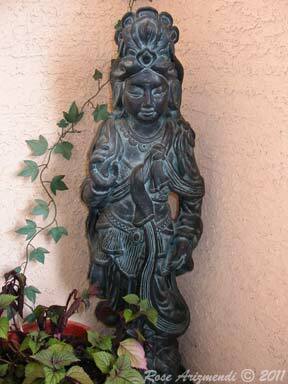 . .
Our patio is home to a couple of statues that are especially meaningful for us. They help remind us to make time for meditation, prayer and reflection. Just by spending a couple of minutes or an hour in sacred space, we refresh ourselves and restore a sense of balance and peace in our lives. A special place to relax, be still and listen. 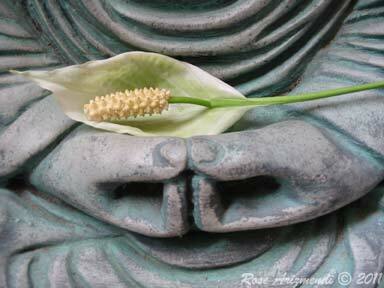 Kuan Yin ~ She is associated with compassion and healing. For me, she is a symbol of the spiritual principles of love, forgiveness, kindness and gratitude. Lovely golden green glass suspended between sky and earth. I found this garden ornament packed away in a box and decided to hang it up to celebrate the changing of the seasons. It reflects the color of nature’s first golden green of spring, the color of joy, wonder and impermanence. While cleaning our zen garden on the patio table, I added a beautiful figurine that we found at one of the local thrift stores for just 25 cents. Love the detail and flow of his clothing. ~ So very Zen! 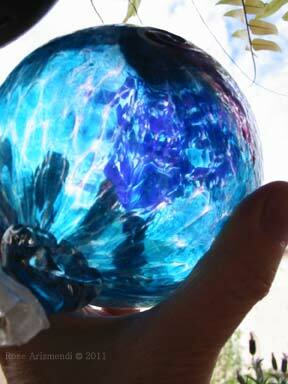 Hand blown glass balls for your garden. 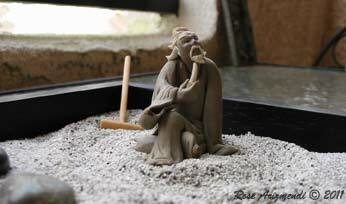 ~ They are said to bring harmonizing energy into your home & garden and deflect negative chi. The blue ball represents the Feng Shui Element Water in places where it’s not easy to have flowing water. This works for me since I don’t have room on the patio for a water fountain. 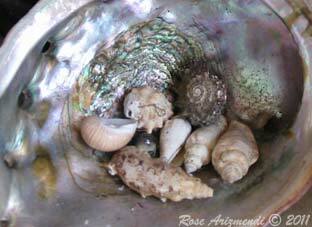 Sea shells that hold memories from special places. 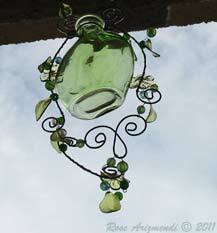 ~ Just another way to add the element of water to your sacred space. When creating sacred space outdoors you can add potted plants, stones, herbs, wind chimes, color and anything else that you love. Sacred space is all about surrounding yourself with things you love and what makes you feel centered, peaceful and balanced.